I’ve written before how, when I see multiple shows in a weekend, there tends to be a connecting thru-line that I never realized when I scheduled these shows. That was certainly true last weekend, and it hit me during the closing scenes of Ada and the Engine at Theatre Unleashed (FB) (studio/stage), which we saw Sunday evening. Earlier that morning I had been at our synagogue’s Purim Carnival, celebrating the agency of Queen Esther in saving her people, and Saturday evening we had seen Matilda Wormwood using her agency — and the power of her mind — to rewrite her story. What hit me as the story of Ada drew to its conclusion was that Lady Ada Lovelace had also used her agency — and the power of her mind — to rewrite her legacy and reputation as the daughter of Lord Byron to become a mathematician. She also overcame her mother’s desire for her to be a distinguished socialite. She became what was (in essence) the first computer programmer. Never mind that the computer didn’t really exist. The computer industry has a long history of promoting vaporware. I first became familiar with Ada Lovelace as I was finishing up graduate school in Computer Science, with a specialty in programming language. I had been following development of the Steelman programming language competition, of which the eventual winner was the Steelman Green language. Steelman Green was eventually standardized and released as the programming language Ada, MIL-STD-1815A. The language has been updated since 1983 when it first came out, but I still have the MIL-STD on my bookshelf. It was named Ada, of course, in honor of Ada Lovelace, the first programmer. This brings us back to Ada and the Engine, written by Lauren Gunderson, who has written a number of science-themed plays. Ada tells the story of Lady Lovelace. It covers her life from when she was an 18 year old mathematician and socialite looking for a husband, through her marriage to Lord Lovelace, up to her eventual death. It focuses, however, on her relationship with Charles Babbage and the work he was doing on the Difference Engine, later the Analytical Engine. Ada is remembered as the first person to see the broad potential of the Babbage’s Analytic Engine, and the developer of the first algorithm for the engine — essentially the first program. But what struck me during the show was how things have changed so little. Ada fought to be seen as more than just a daughter of her famous father, or wife of her famous husband. She was forced into a role, and not seen at the time for the mathematical talents and insight that she had. In a world where women engineers have to still fight for recognition parity and pay parity, can we really say we’ve improved all that much. As Gene Spafford has written: We are out of balance with respect to women in technology. Ada and the Engine reminds us that this has been a long battle. But Ada, and Esther, and Matilda remind us that we have the power to rewrite the story — we have the power to increase the visibility and parity of women in STEM fields (and I would be remiss if, at this point, I didn’t mention my long-term involvement with the sponsors of the Scholarships for Women Studying Information Security (SWSIS), which everyone should support). PS: You want proof that there’s discrimination against women in STEM? NASA just cancelled the first all-women spacewalk because they didn’t have two suits of the right size for women. Back to Ada and the Engine: Knowing my background and my history, it is probably not a surprise that I really enjoyed the show. So did my wife, who is also an engineer. We felt that the story captured well the history and excitement of Ada, and brought her to life with a wonderful energy and … for us … the correct math and science. It was also helped by the fact that, under the direction of Heidi Powers (FB), the cast brings the story to life with exuberance and joy. In the lead position is Jessie Sherman (FB) as Ada Lovelace . We saw Sherman last summer in Beauty and the Beast at 5-Star Theatricals, and she brought the same energy and giddyness to Lovelace. I think the best way to characterize her performance is that the mathematics were bursting out of her in excitement, and that joy made her performance special for the audience. She also had a few singing moments in the show that were quite beautiful, using musical arrangement from Jennifer Lin, who is the musical director of Matilda. Connections, folks, connections! The music and lyrics for those songs were by The Kilbanes. Playing the main men in her life were Alex Knox as Charles Babbage and Gregory Crafts (FB) as Lord Lovelace. Both literally towered above Sherman — I think they had at least a foot and a half of height on Sherman, providing a metaphorical demonstration of the difference in stature. Knox’s Babbage captured the excitement of an engineer and scientist of the age — as well as the arrogance. His performance presented an interesting relationship between the quasi-romantic (but perhaps only in the mind) and the business relationship, and demonstrated well the power dynamics that often come into play with women in the professional technical world. Crafts had a different role: the husband of someone who didn’t understand his wife having a technical relationship and friendship, but who learned how satisfaction of that aspect of his wife’s nature made her whole. Anyone who is married to an intellectual or a scientist understand that well, and I think Crafts portrayed it right. I must also acknowledge all the work that Crafts has done outside this show for the LA Theatre community and the #Pro99 efforts (I was one of the audience members speaking up on behalf of that effort). As Ada’s moether, Anabella Byron, Denise Nicholson (FB) brought the right level of sternness and disapproval and authority to the role. Watching her facial expressions while Ada was interacting with Babbage said multitudes about her attitudes on the matter. Rounding out the cast was Casey Hunter (FB) as Lord Byron and Michelle Holmes (FB) as Mary Somerville. Hunter’s Byron is really only seen (as Byron) in the opening and in the final scenes, but he does a great job with those closing scenes. Holmes role is even smaller, showing up introducing Ada to Byron at a few parties. The scenic aspects of the show — set, props, and hair design — were handled well by Jenn Scuderi Crafts (FB), who did a really great job with a small budget. Costumes were designed by Denise Barrett (FB), and worked well. Movement was choreographed by Roger Fojas (FB). This went beyond the few dance numbers; there was some really interesting choreography as the actors portrayed the analytic engine and the gears and cogs that made it work. The sound design of Graydon Schlichter (FB) provided the appropriate ambient sound effects, and Gregory Crafts (FB) lighting established time and place well. It also worked well with Kevin Hilton (FB)’s projection design, which provided context and the background mathematics. Other production credits: Tanya Nancy Telson (FB) — Stage Manager; Tom Moore (FB) — Dramaturg; Rosie Bryne (FB) — Dialect Coach; Jim Martyka (FB) & Gregory Crafts (FB) — Publicity; Matt Kamimura (FB) — Production Photography. Ada and the Engine, continuing the parallelism with Matilda the Musical, also runs through March 31, 2019. Tickets are available through the Theatre Unleashed website. Discount tickets may be available through Goldstar. As an engineer, programmer, and mathematician (really, my Bachelors degree from UCLA is in Math/Computer Science; my Masters in in Computer Science), I found this to be a wonderful show. The science is right, the story is right, and the performances were great. It is well worth seeing. March was to conclude with us back at the Hollywood Pantages (FB) for Charlie and the Chocolate Factory, but that date had to chance so that we could attend the wedding of our daughter’s best friend, who is a wonderful young woman. The most important thing to remember, when thinking about the production Cats (currently at the Hollywood Pantages (FB)), with music by Sir Andrew Lloyd Webber and lyrics (mostly) by T. S. Eliot* (supplemental lyrics by Trevor Nunn), is that it is not a musical, despite everything you hear. It is a dance show, pure and simple. Go in thinking that, and you won’t be disappointed by the paper thin plot, the lack of real characters, the absence of character growth, or any silly musical theatre notions like that. If you read reviews of Cats and you find they are disappointed with the show, 9 times out of 10, you’ll find that they were going in expecting a traditional musical. So, I’ll say it again: Cats is a dance show. And as a dance show, it is a spectacular one, with catchy if simplistic tunes that exist solely to support the dance, wonderful movement, and some lovely character vignettes that showcase characters you don’t see again as their characters. This shouldn’t be surprise, as this show was based on a collection of children’s poems, not any sort of story or novel with a through line. I”ll repeat it a third time, because if you say it three times it must be true: Cats is a dance show. It only lacks the introduction that Bob Fosse put on his show Dancin’: “This show has no plot; it is a dance show.”. I’m a big fan of comparing and contrasting shows, and ignoring my sojourn into Silly Symphonies at the Soraya the weekend between, I had two dance shows in a row: Matthew Bourne’s Cinderella at the Ahmanson, and Cats at the Hollywood Pantages (FB). Both celebrated and were centered around dance. One told a story without words, showing character growth. One used words to accompany the dance, but really didn’t tell a story. One used the classical repertoire; the other used more pop and rock stylings. One shows up only periodically; the other was one of the longest running shows on Broadway. Ultimately, I think I found Cats more satisfying. Perhaps it is the whole issue of accessibility. Using more modern music, and having songs to accompany the dance, ultimately made the dance itself more satisfying. The paper thin story went by the wayside, and one could enjoy the dance for what it was. With Cinderella, one had to focus on the dance and the language of the dance in order to figure out the more substantial story — and in doing so, the enjoyment of the dance itself was lost. We last saw Cats in 2009 at Cabrillo Music Theatre (now 5 Star Theatricals (FB)); before that, it was the original production in 1985 at the Shubert Theatre in Century City. There are those who somehow believe there is a story line in Cats. They think it has something to do with cats auditioning to go to the Heavyside layer, and ultimately Grizabella the Glamour Cat being chosen for no reason other than she has the one new song in the show. But given you really only see the other cats do their numbers and disappear (only three remain really visible in the ensemble dancing — Mungojerrie, Rumpleteaser, and Rum-Tum-Tugger), that story isn’t really there. It is grafted on to give an excuse for the song “Memory”. Don’t think about it. This is a dance show. Enjoy the spectacle. I must, however, note some interesting story changes in this version. At the top of Act II, we have Gus the Theatre Cat’s number. Normally, this has been “Growltiger’s Last Stand”, with the whole number with the Siamese cats that was borderline offensive when the show premiered in the 1980s (with the use of stereotypes and such — not surprising, given when and where the poems were written). The 2016 revival on Broadway replaced that number with a different poem, “The Pekes and the Pollicles”, using some but not all of the original music. The new number works, but it creates an interesting discontinuity in the “McCavity” number where a mention is made of Griddlebone — who is now no longer in the show. Some other numbers have had their tempos changed or adjusted. I believe some of these adjustments derived from the 2015 London revival. It is also important to understand the role productions such as Cats play in the musical ecosystem. Cats is not a star vehicle. Sure, there can be a star turn for the actor playing Grizabella — they get to shamble on, sing a spectacular number, shamble off, and then in the second act, shamble back in, sing a reprise of that number, and then die on stage. But for all the other actors in the show: this is ensemble heaven. It is a training ground for dancing, singing, and background characterization. When you go into the show, look for that. Watch each individual cat and how they succeed or fail in making each cat their own character. Look at their movement. Note who they are. This is how they get their exposure: doing this show with a paper-thin plot but spectacular movement and characterization exercises. For many of them, you’ll see them grow over the years into musical or dance mainstays. But there is that one problem of identifying the performers. The individual cats are not all named in the show, so how do you know who is who? These answer is that the Wikipedia page provides a list of all the cats, their names, and a description of their costumes. This is a must, and should be in every program, because the individual cats are never introduced in the show — and other than the actors, the audience has no way of knowing who is performing whom (unless they happen to have done the show before). I think providing this listing would be a courtesy to the actors/dancers, as then they can be properly credited for their outstanding work. Caitlin Bond (FB)’s Victoria (the white kitten) is just amazing. Her moves and her talent are just wonderful. I really enjoyed watching her. Rose Iannaccone (FB)’s Rumpelteazer was also fun to watch. Small, lithe, and with some spectacular moves — as well as great facial expressions. My eyes kept being drawn to her. Emily Jeanne Phillips (FB)’s Jennyanydots did a spectacular tap number. I tried to recognize her elsewhere in the show, but couldn’t. PJ DiGaetano (FB)’s swung into Mr. Mistoffelees, and did an outstanding job with it. DiGaetano normally portrays Coricopat. Keri Rene Fuller (FB)’s has essentially a “walk-on” as Grizabella — she doesn’t really do all that much dancing. She does, however, get the powerhouse number in the show: “Memory”, and she does wonderful with that number. Timothy Gulan (FB)’s does good as Asparagus, the Theatre Cat — I liked his characterizations and facial expression. I was a bit less taken with his Bustopher Jones. Erin Chupinsky (FB) swinging in as Demeter, and Charlotte O’Dowd (FB) swinging in as Bombalurina, did a wonderful job on “McCavity” with some spectacular dancing. McGee Maddox (FB) gave a strong turn as Rum Tum Tugger/Bill Bailey. A different swagger in the characterization than I’ve seen before, but fun to watch. Marian Rieves (FB)’s Cassandra is one of the ensemble cats that catches your eye. A seemingly Siamese shorthair (at least she has a more slinky costume than the other cats), she has wonderfully lithe movement. Her tumbling runs were incredible. Ahren Victory (FB)’s Sillabub is the cat that sings with Fuller’s Grizabella, and does a spectacular job of it. The other performers were strong dancers, but other aspects of their performances either didn’t stick out in my mind, or I couldn’t identify their character well enough to comment. Other cast members were: Phillip Deceus (FB) [Alonzo]; Lexie Plath (FB) [normally Bombalurina, but out last night]; Justin W. Geiss (FB) [Swing, who I’m guessing swung in for Coricocat]; Liz Schmitz (FB) [normally Demeter, but out last night]; Kaitlyn Davidson (FB) [Jellylorum]; Tion Gaston (FB) [normally Mistoffelees, but out last night]; Tony d’Alelio (FB) [Mungojerrie]; Dan Hoy (FB) [normally Munkustrap, but out last night]; Tyler John Logan (FB) [Plato / McCavity]; Anthony Michael Zas (FB) [Pouncival]; Ethan Saviet (FB) [Skimbleshanks]; Halli Toland (FB) [Tantomile]; Devin Neilson (FB) [Tumblebrutus]; Brandon Michael Nase (FB) [Victor / Old Deuteronomy]; Maria Failla (FB), Adam Richardson (FB), Tricia Tanguy (FB), Andy Michael Zimmermann (FB) [Cat’s Chorus]; Zachary S. Berger (FB) [swinging in as Munkustrap]; Nick Burrage (FB) [Swing]; and Laura Katherine Kaufman (FB) [Swing]. The Cats orchestra was conducted by Eric Kang (FB), who was also musical director. Other members of the orchestra ( indicates local) were: Evan Roider (FB) [Assoc. Music Director, Keyboard3]; Luke Flood (FB) [Keyboard1]; David Robison (FB) [Keyboard2]; Garrett Hack (FB) [Reed1]; Dave Stambaugh (FB) [Reed2]; Ralph Agresta (FB) [Guitar]; John Toney (FB) [Bass]; Aaron Nix (FB) [Drums / Percussion]; Jeff Driskill (FB)  [Flute / Clarinet / Tenor Sax]; Sean Franz (FB)  [Clarinet/Soprano Sax/Bari Sax]; Mike Abraham (FB)  [Guitar (Electric, Steel String Acoustic, Banjo, Nylon String Acoustic)]; Dan Lutz (FB) [Bass (Electric, Fretless)]; William Malpede  [Keyboard Sub]. Orchestra support: Eric Heinly (FB)  [Orchestra Contractor]; Kristen Blodgette [Music Supervisor]; Brian Taylor (FB) [Assoc. Music Supervisor]; Stuart Andrews [Keyboard Programmer]; and Talitha Fehr [Music Coordinator]. Turning to the production and creative side of the equation: Alas, nothing can top the original scenic design in the Century City Shubert theatre, where the entire theatre was transformed into a larger-than-life junkyard. This is a tour, which constrained John Napier‘s scenic design primarily to stage, with a few rows of lights. It was still a junkyard; just not as immersive. The audience did, however, get to see Napier’s design in another area — the costumes — when the actors came into the audience. Still, even here he was constrained by the original, as he had to keep the character designs within the constraints of the original design. Still, the impact of the actors going in the audience should not be discounted; Marian Rieves relates the story of going into the audience in the Pantages and making a little black girls day by showing what she could be when she grows up. Theatre does change lives. Where there has been a significant change since the original production is in the technology, and that is no where more apparent than in Natasha Katz‘s lighting design. Lightweight LEDs have transformed the theatre, from the eyes on stage, to Mr. Mistoffelees’ spectacular costume, to the changing colors of the light strands, to the on-stage flashlights. Katz’s design makes use of this well. Victoria Tinsman (FB)’s hair and makeup design is a key part of these characters, and what I’m sure was a time-consuming job paid off well in their looks. About the only weakness was Mick Potter‘s sound design: one of the characters had a very muffled microphone (I want to say Alonzo), and my wife noticed a number of balance problems. As an aside, I’m so looking forward to productions at the Dolby Theatre, because it should not be plagued with the muffled sound that is endemic to the Pantages’ rococo design. Knitting by Jo Thompson (Leg and Arm warmers) and Marian Grealish (Skimbleshanks / Victor). One other key creative credit for this show: Neuro Tour provided the physical therapy, which I’m sure these dancers depend upon. Other production and creative credits: Chrissie Cartwright (FB) [Assoc. Director / Choreographer]; Kim Craven (FB) [Assoc. Choreographer]; Ellenore Scott (FB) and Lili Froehlich (FB) [Asst. Choreographers]; John Clancy [New Dance Sequences for selected numbers]; Nick Burrage (FB) and Erin Chupinsky (FB) [Dance Captains]; Tara Rubin Casting (FB) [Casting]; Abigail Hahn (FB) [Assoc. Costume Designer]; Donovan Dolan (FB) [Production Stage Manager]; J. Andrew Blevins (FB) [Stage Manager]; Laura C. Nelson (FB) [Asst. Stage Manager]; Aaron Quintana (FB) [Company Manager]; Justin Coffman (FB) [Asst. Company Manager]; Troika Entertainment LLC [Tour Manager]. Cats continues at the Hollywood Pantages (FB) through March 24. Tickets are available through the Pantages website; discount tickets may be available through Goldstar or TodayTix. After Los Angeles, the Cats tour moves on to Seattle WA. If you like theatrical dance, it is worth seeing. If you are looking for a real musical with a plot and deep characterizations, and a storyline that means something, pass. Cats is a dance show, as I’ve said before. PS: Let’s start the rumor: Cats in Yiddish. Ketz anyone? * ETA: Something I never knew: T.S. Eliot was antisemitic. Luckily, I don’t think he is making the big bucks off the musical, nor do I think there are any such references in this work, but it does make “Growltiger’s Last Stand” even more problematic. 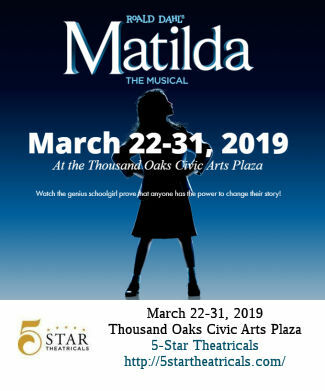 Next weekend brings Matilda at 5 Star Theatricals (FB) on Saturday, followed by Ada and the Engine at Theatre Unleashed (FB) (studio/stage) on Sunday. March was to conclude with us back at the Hollywood Pantages (FB) for Charlie and the Chocolate Factory, but that date had to chance so that we could attend the wedding of our daughter’s best friend, who is a wonderful young woman. April starts with Steel Magnolias at Actors Co-op (FB) and the MoTAS Men’s Seder. During the week, we are back at the Hollywood Pantages (FB) for our rescheduled performance of Charlie and the Chocolate Factory. The next weekend has a hold for OERM. April will also bring Fiddler on the Roof at the Hollywood Pantages (FB) and the annual visit to the Renaissance Pleasure Faire. Looking to May, only four shows are currently programmed: Falsettos at the Ahmanson Theatre (FB), Les Miserables at the Hollywood Pantages (FB); The Christians at Actors Co-op (FB); and Lea Salonga at the Saroya [nee the Valley Performing Arts Center (VPAC)] (FB). Because some of those shows are mid-week, two weekends are currently open (but will likely be programmed as press announcements are received). June, as always, is reserved for the Hollywood Fringe Festival (FB). Amazon’s streamlined plastic packaging is jamming up recycling centers. One area of interest to me is plastics, and the growing amount of plastics in our waste stream. They are hard to recycle, and even their presence makes things that are normally easy to recycle very difficult (think plastic tape on packaging). This article explores a recent change made by Amazon in their packaging. Amazon is an interesting case, for they require extra packaging as they ship everything. Over the last year, Amazon.com Inc. has reduced the portion of shipments it packs in its cardboard boxes in favor of lightweight plastic mailers, which enable the retailing giant to squeeze more packages into delivery trucks and planes. But environmental activists and waste experts say the new plastic sacks, which aren’t recyclable in curbside recycling bins, are having a negative effect. The problem with the plastic mailers is that they need to be recycled separately, and if they end up in the usual stream, they gum up recycling systems and prevent larger bundles of materials from being recycled. It’s a really hard question. Cardboard is easier to recycle. But it is heavier, takes up more space, and requires more trucks, which have more environmental impact. Plastic takes less space and less trucks, but is harder to recycle and can contaminate the recycle stream. Why your desk job is so damn exhausting. Think about it: Which is more exhausting: a job that requires physical manual labor, or a desk job behind a computer all day. You would think the former. This articleexplores one of the more hotly contested issues in psychology: What causes mental fatigue? Why is desk work so depleting? It presents the two main hypotheses for why we get so tired from work when we’re not physically active. Hypothesis 1: we get so tired because we deplete an internal store of energy. The problem is, increasingly, psychologists aren’t sure it’s real. Hypothesis 2: we get so tired because our motivation runs out. We become drawn to the things we want to do, rather than the things we have to do. And this tension possibly causes fatigue… and blog posts like this… did I type that with my public fingers? How to Make Your Office More Ergonomically Correct. Here’s another thing that could be making you tired: Your office layout. At the end of last year, I moved offices — meaning a new desk and new monitor support, and it took me a while to make things comfortable. I’m still not 100% sure it is right. This article explores how to ensure that. Remember: About $1 billion a week is spent in the United States to deal with entirely preventable work-related musculoskeletal injuries, many of which are caused by small flaws in body positioning. You can do a surprising amount of damage to your body if you hold parts of it in strange positions for hours at a time, five days a week. But some research suggests that you can also prevent and even reverse damage by engineering your office work environment properly. How to responsibly get rid of the stuff you’ve decluttered. Right now, society is on a decluttering trend. More and more stuff is being removed from closets and houses, and it has to go somewhere. You want it to go to the right place. Last thing you want to do is add it to the trash stream, especially for clothing. This article explores the best way to get rid of different classes of stuff you may be (shall we say) de-accessioning. For us, it will probably be participating in a multi-family estate sale in a few months. Why so many financially independent adults are still on their parents’ phone plans. You would think, as you become financially independent and move out of your parent’s house, that you would financially separate from them. But that doesn’t always happen — and for good reasons. Kids stay on their parent’s health insurance until they are 26 because that’s often much cheaper (especially for insurance you get through work). Often Car Insurance is bundled if it makes financial sense. This article explores the reason that kids are on their parent’s phone plan — and it is often for the same reason: adding an extra line to your phone is much much cheaper than having a separate plan. The periodic tables we almost had. Design is an area that fascinates me. This explores how we got the current design of the periodic table, exploring its evolution over time. It was surprisingly hit and miss, settling down as we began to learn more. But in many ways it is still imprecise, and not an accurate model. I tend to like the “Underground Map of the Elements” m’self. The Aldi effect: how one discount supermarket transformed the way Britain shops. Yes, I know, I’m not in the UK. But this article — which looks at the evolution of Aldi as a market and its expansion into the British market — provides some fascinating insights into the US: especially the difference between Trader Joes (owned by Aldi North), and Aldi (owned by Aldi South). If you don’t know what I mean by Aldi North and Aldi South, you really need to read the article. Community colleges can cost more than universities, leaving neediest students homeless. We’ve all been taught that it is cheaper for students to go to community college than a big university. But what if that is wrong? This article explores why it is wrong — and the answer is interesting. Community colleges do cost less tuition-wise. But because they have lower tuition, they also have lower financial aid — meaning that students get less support in paying for those units. There is also less to no housing aid, meaning students are on their own to find housing. This makes the total cost often higher than a mid-tier state university with aid. Off the chart: the big comeback of paper maps. We often think mapping apps will be the death of paper maps, but that’s not the case. This article explores why. In a time when facts are to be treasured, perhaps paper maps have real significance, recording as they do a version of the truth less susceptible to tampering and fakery. The effects of the digital era on humans’ mental map abilities are becoming apparent. A recent study at the University of Montreal found that some video games that relied on non-spatial strategies could reduce growth in the hippocampus, an all-important region for mental mapping. The recent discussions of Ilhan Omar and antisemitism have reignited the debates of racism and divides in this country. On the Democratic side there is the push to condemn antisemitism while not offending those who either disagree with the behavior of the Israeli government, or to include other racist attacks. On the Republican side, there is the push to condemn antisemitism while ignoring similar behavior within the Republican party. But the truth is, despicable behavior and intolerance — racial, political, and other — exists on both sides. Political scientists have found that our nation is more polarized than it has been at any time since the Civil War. One in six Americans has stopped talking to a family member or close friend because of the 2016 election. Millions of people organize their social lives and their news exposure along ideological lines to avoid people with opposing viewpoints. What’s our problem? I know I’ve fallen into this. I’ve begun to block memes from the side I disagree with: I find them annoying, but it is pointless to comment on them and point out the errors because the other side won’t listen anyway. Why won’t they listen? Another article I found explores this quite well, detailing 24 cognative biases that shape our thinking. These are flaws in human reasoning that political machines can exploit to make our biases stronger. You can combat them to some extent if you know what they are (just as you can filter out the bias from news sources if you know it), but you will never succeed completely. These biases and prejudices and hatred and contempt are playing out in many discussions we see in the news today. But it isn’t just the news. Racism and hatred can be anywhere, including your local knitting store. Online bots can take racism and hatred, and amplify it. The best way to combat it? First, educate yourself to recognize it. Second, speak out and don’t let it go unchallenged. Third, engage as much as you can. There is a balance between those who cannot be redeemed, and those whom you can educate about their bias. Don’t expect to change minds immediately; but do work to plant the seeds.